Something stole/ate all my garlic?!!??!! Oh yeah, boy am I stupid it's over here. Here is the Cheznok Red and Music about 91 bulbs. Here is the Georgian Crystal. This is a rouge Georgian Crystal. Hanging with Pescadero Red on the table they are done. Here was the Pescadero Red a week or so ago hanging. 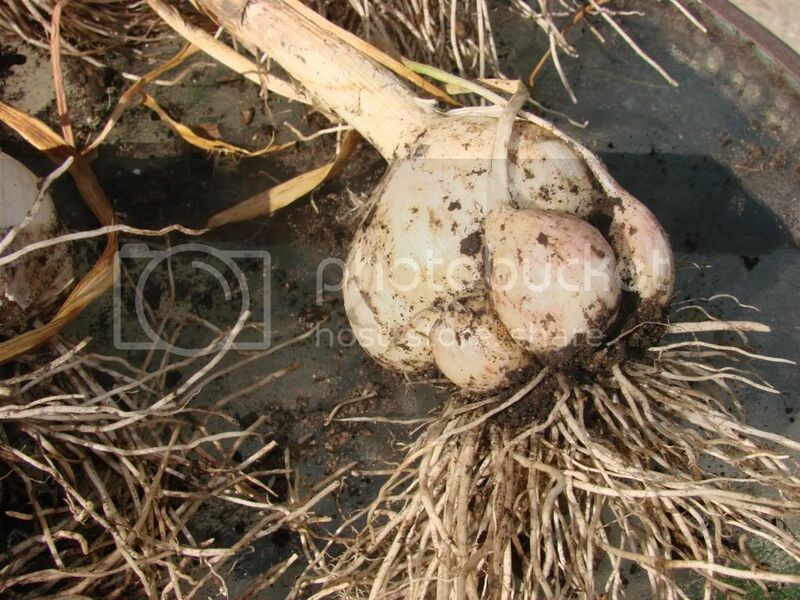 It is a smaller variety but don't let it's size fool you this is one tasty garlic. Last edited by gixxerific on Sun Jun 24, 2012 1:25 pm, edited 1 time in total. No bloodsuckers at gixx's, that's for sure. So how do you taste test garlic? very nice garlic looking good!!! 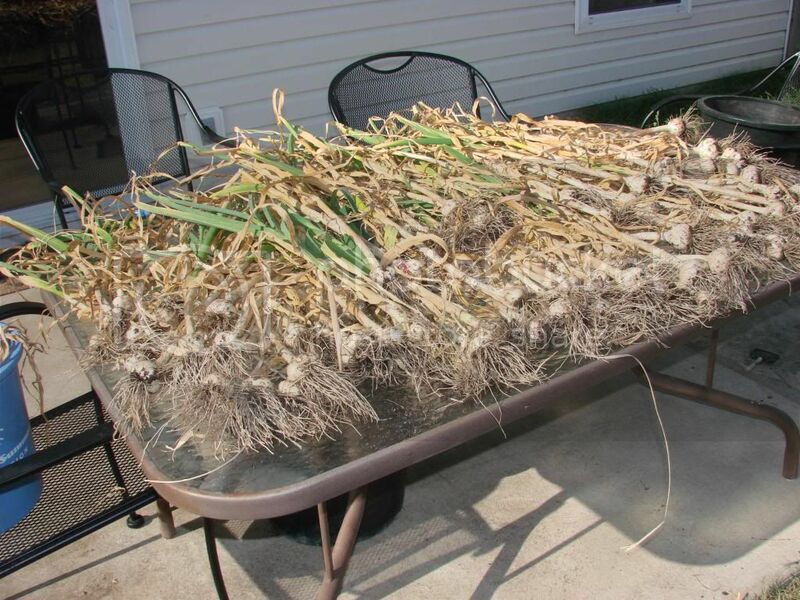 I wish I could say my garlic harvest would look the same. The seed garlic you sent me, along with what I could find elsewhere all rotted in the ground over a 2 week period of very heavy rains. My garden stayed soggy to the point where I'd walk between the rows and have my feet ankle deep in mud. I'll try again this fall and hope for the best. But that is how gardening is. Just like last year and my great tomato crop and this years bug infested, disease ridden crop making for a meager harvest by comparison. We had a very wet spring and the top growth didn't die back like usual. Of course that was in May and we usually harvest our garlic in mid June. 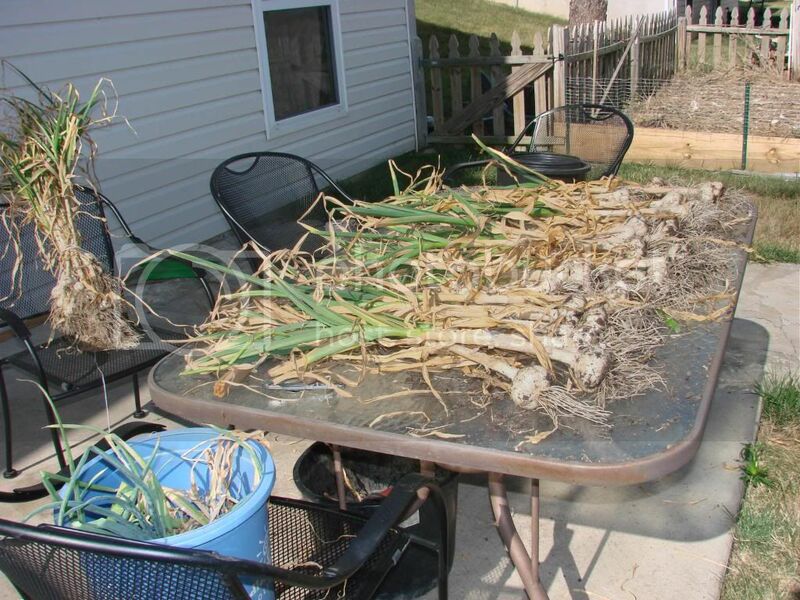 But when I started digging the garlic a few weeks ago, some has signs of rot and most which wasn't rotting had lost 100% of its outer coverings. Now the fridge is housing two large containers of totally clean, ready to use garlic. I don't know how long it will last like that, with no sheath whatsoever, but so far quality is good and at least we didn't lose all of those precious cloves. I probably only harvest about 35 bulbs which appear to have dried properly and which will store from now until early winter. 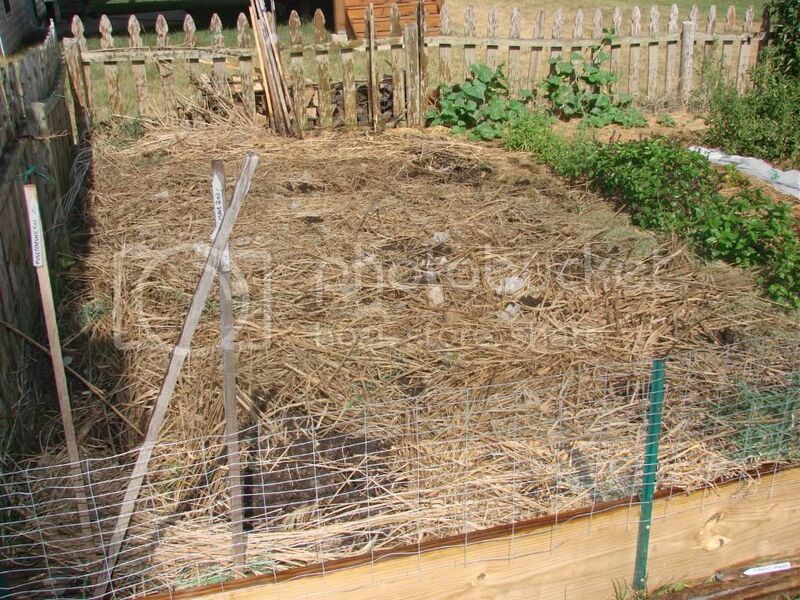 I ordered fresh planting stock this year, so won't have to rely on our harvest to provide for next year's crop. Still will use some of our largest cloves for planting. 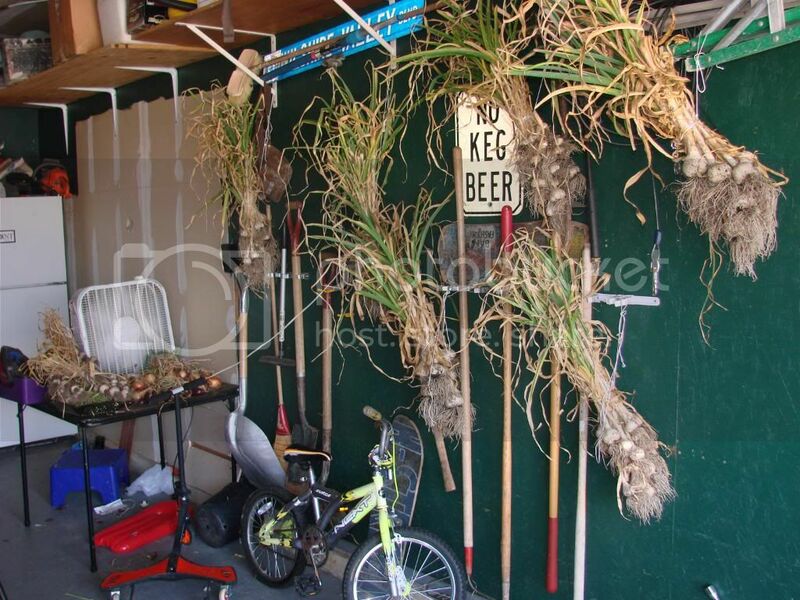 All of my garlic was planted in raised beds filled with about a 50-50 blend of compost and commercial potting mix. That hold water very well but also drains well. 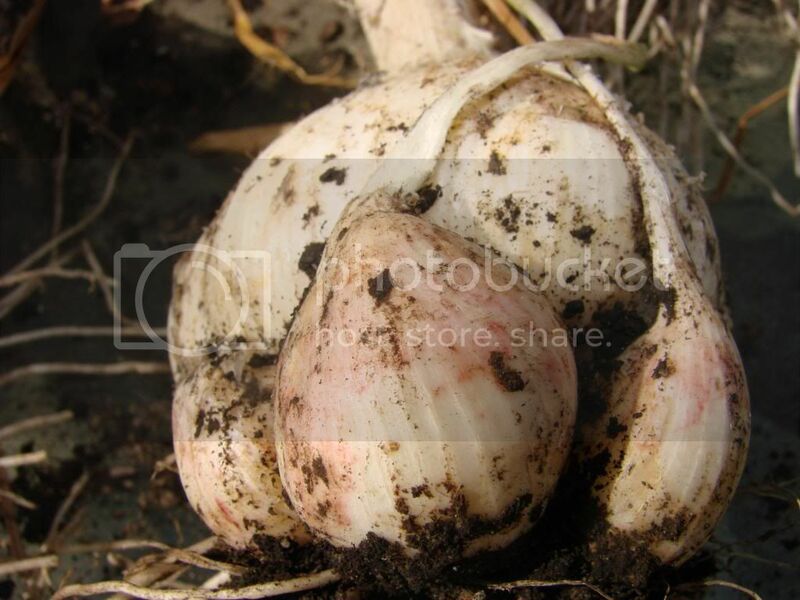 Next year I'm going to plant about half of our garlic directly into the very sandy soil. That way if we get lots of rain, the garlic will not suffer the kind of break down that it did this year. hendi_alex wrote: We had a very wet spring and the top growth didn't die back like usual. 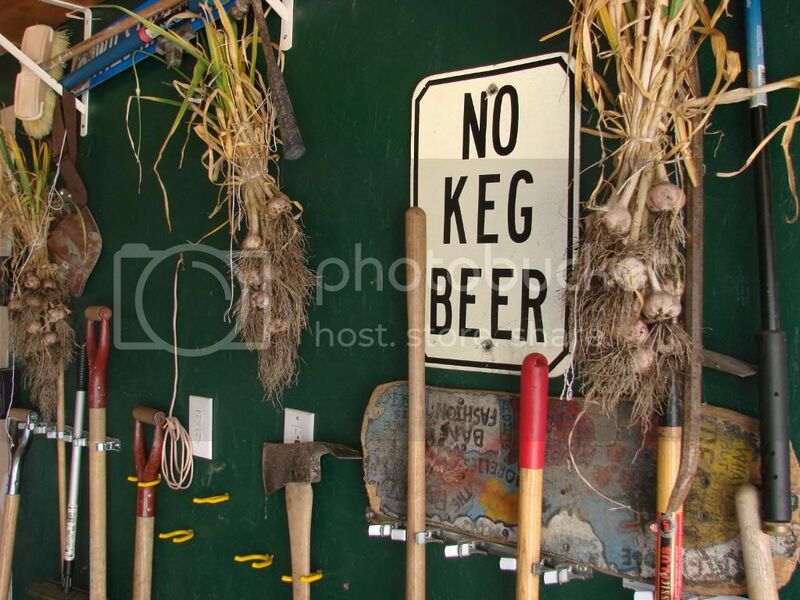 Of course that was in May and we usually harvest our garlic in mid June. But when I started digging the garlic a few weeks ago, some has signs of rot and most which wasn't rotting had lost 100% of its outer coverings. Now the fridge is housing two large containers of totally clean, ready to use garlic. I don't know how long it will last like that, with no sheath whatsoever, but so far quality is good and at least we didn't lose all of those precious cloves. I probably only harvest about 35 bulbs which appear to have dried properly and which will store from now until early winter. If it looks like your garlic won't store without the sheath, another way to store it is to mince it to a fine consistency and add olive oil to it in a jar. That will keep in a fridge for a long time, but it does give the garlic a little different flavor and is still good for use in cooking. Thanks for the reminder. Last year I minced garlic, placed it in ice cube trays and then filled the cells with olive oil. Then froze the cubes and stored them in zip lock bags. That garlic held up well from one season to the next. I'm a little nervous to store garlic in oil and not freeze it. Garlic in oil is supposed to be a perfect environment for botulism. And while the fridge might slow that process, I'm not confident that refrigeration will completely eliminate the risk of botulism. what's next with my garlic?? ?